In the Micro category, it was 11-year old Yash Aradhya representing MECO racing who emerged victorious in what was without doubt the most enthralling race of the day. The Bangalore lad didn’t start the race on the right foot as an unfortunate incident in the pre-final round saw him getting bumped off the track and this meant he had to start from 12th position in the final race. But Aradhya capitalised in the incident packed race to climb up the grid and was soon battling in a three-way scuffle for the lead between himself, Paul Francis and Shahan Ali Mohsin. The trio kept on exchanging the lead and there was more action in the above race than one gets to witness in an entire season of F1 and it was a delight to see such young kids driving on the limit. But it was Aradhya who claimed top honours after passing Francis in the penultimate lap who was visibly disappointed after coming so close to a win. Shahan Ali Mohsin claimed the final step on the podium in the Micro category. 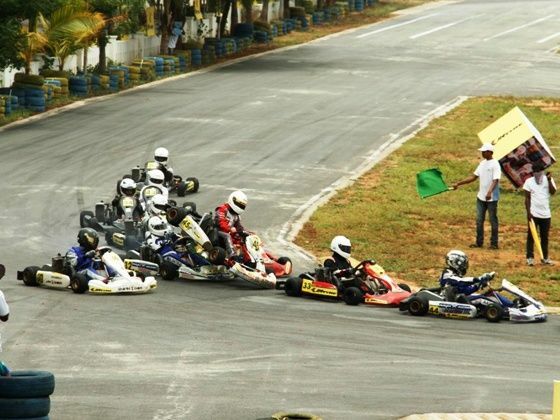 The Junior Max category of the JK Tyre National Karting Championship also witnessed its fair bit of action. Right from the start it was clear that the race would be won by either Dark Don Racing’s Kush Maini or the new kid on the block Ricky R Donison of BPC. The duo kept on exchanging the lead throughout the race and Maini defended his lead aggressively and one occasion even tried to push Donison off the track. The race ended with Maini crossing the finish line ahead of Donison but there was more drama in store. A visibly upset Donison walked off from the pit lane and owing to his action he was disqualified from the race. Maini was also given a 10 second penalty for rash driving that relegated him to third place. Benefiting from this reshuffle was Akash Gowda, who was adjudged the winner followed by Aaroh Ravindra in second position. The Senior Max category was a quite affair in comparison to the other two categories. Ameya Bafna from Rayo Racing made a brilliant start to get away from the trailing pack of drivers. He was able to maintain a comfortable lead throughout the race and despite the best efforts of his rivals; he crossed the finish line with a healthy lead. Finishing in second place was Mohites Racing’s Chittesh Mandody followed by Krishnaraaj Mahadik to round off the podium.